Here are some fond memories by undergraduates about their experience on the recent Glee Club tour. Share your own with us in the comments section below! 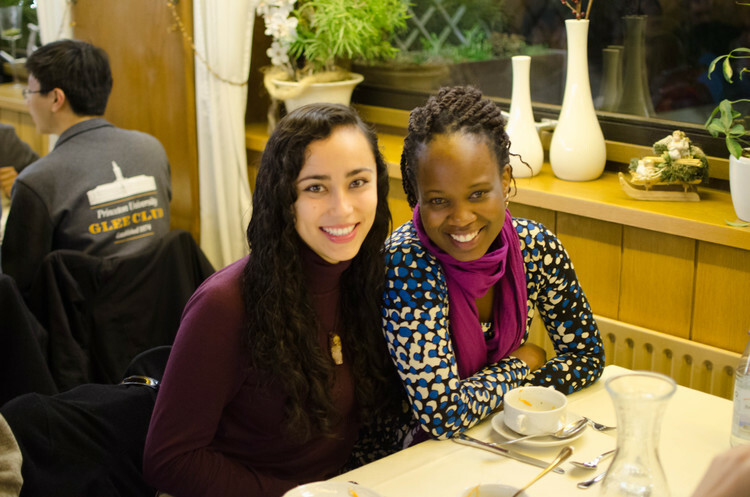 We awoke on Saturday morning for our final full day of our tour in Leipzig, and were welcomed by a buffet of mixed meats, assorted jellies, and other morsels for our eager stomachs. We then set off with tour guides to explore the rich architecture and history of the 999-year old city. As a crossroads between Europe’s two main trade routes, Leipzig grew as a center for trade and culture over the last millennium. The music in Leipzig was manifest, second only to Vienna in terms of the presence of famous classical composers who had a relationship with the city. It was amazing to walk within a few blocks and discover the school that young Wagner attended, the location of the apartment where Mendelssohn lived, a coffee shop where a variety of composers like Berlioz and Robert and Clara Schumann frequented, and Nikolaikirche (St. Nicholas Church), where Bach’s Magnificat was premiered. The older baroque architecture was mixed with modern styles, as much of the historic city center had been destroyed by bombings in World War II and rebuilt. However, the city’s spirit clearly survived through its variety of shops, museums, and musical experiences. 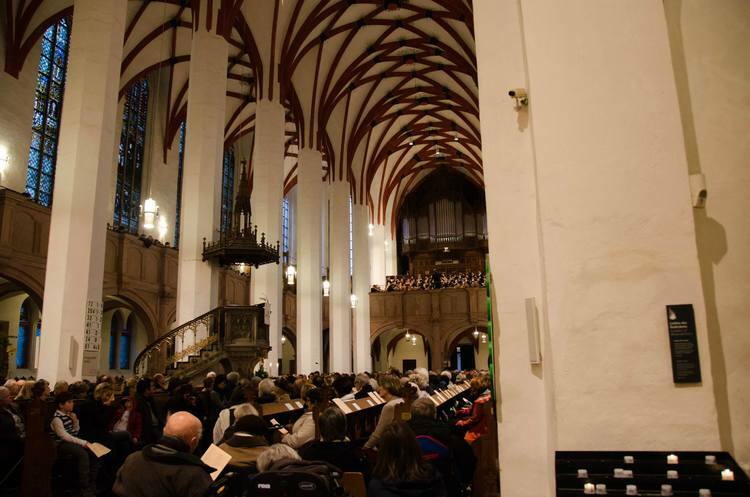 After the tour we returned to the Thomaskirche for a rehearsal with the Leipziger Barockorchester on an entirely Bach repertoire for the afternoon service. We were all in awe of the professional sound of the orchestra – everything from the precision of the violin runs to the blended timbres of the horns. After a short break, we changed into concert dress and took our places up in the balcony of the church in front of the massive organ. The performance was truly an unreal experience. We performed our first piece O Jesulein Süß a cappella, followed by a beautifully conducted rendition of O Jesu Christ Mein’s Lebens Licht under the direction of our assistant conductor, Kamna. Our final piece was the famous Magnificat, and truly felt like the musical culmination of our trip. 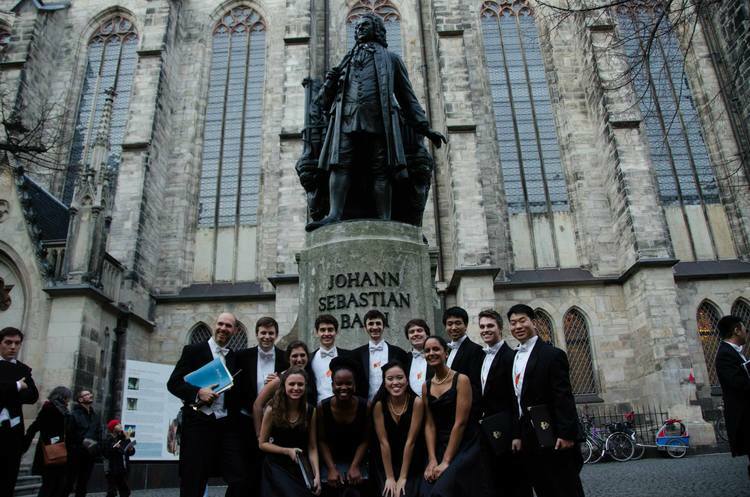 What could be better than singing one of Bach’s most famous pieces at Bach’s own church and final resting place? All of the soloists performed with vitality, and we could see just how overjoyed our conductor, Gabriel Crouch, was for the experience conducting the piece. And, of course, all of the members of the choir were ecstatic as well! It was a little strange not to receive any applause after our performance (it was a church service after all), but we all certainly felt proud of the result of weeks of hard work on this music. Following the performance, we took some group photos and had a few hours to explore the city on our own. Some of us took to the nearby bratwurst stand—others to the local shopping centers. We later reconvened to celebrate with one final dinner of German cuisine and libations where we toasted all of the people who helped make this tour possible: Jürgen our coach driver, Kerry our accompanist, Katherine our tour manager, Johan our tour guide, Gabriel, our esteemed conductor, and, of course our alumni and supporters without whom this trip would not have been what it was. They made sure that every stop was truly unforgettable. Spirits were high, and the upperclassmen shared goodbyes for what was their final glee club tour--an experience that they will surely carry with them, as so many PUGC alumni have in the past, for the rest of their lives. The group then split off to continue celebrations at various nightclubs and bars across the city. Even with the looming 4:30 AM wake-up call, many of us continued dancing and hanging out with fellow glee clubbers into the night, squeezing as much out of the wonderful city as possible. We had another special treat awaiting us in Leipzig... a dinner for the whole choir provided by Bill and Judy Scheide, whose warmth and generosity has touched the City of Leipzig almost as much as Princeton University. 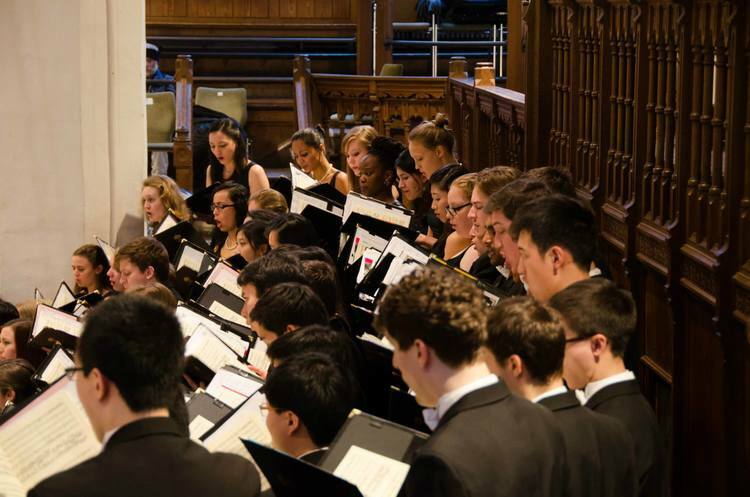 Judy Scheide heard the Glee Club performing Bach's Magnificat in December, and told us afterwards that she wanted to give the choir something to help us remember our time in the city that Bill loves so much. The venue she chose was the Thuringerhof - a restaurant which has served the city continuously for more than five centuries, and which has seen all the greats of Leipzig eat and drink within its arched halls - Luther, Goethe, Schumann, Wagner, and of course, Bach himself. We had a sumptuous meal, followed by a joyful awards ceremony and the singing of almost all our memorized repertoire, as our fellow diners gathered around to cheer us on. 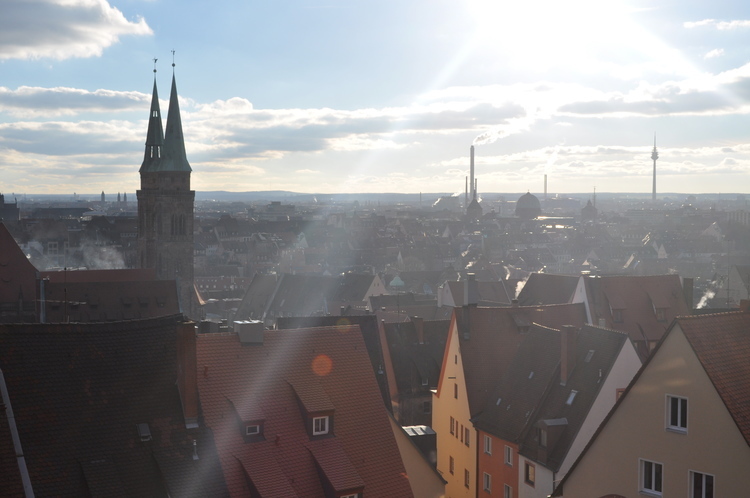 Truly, an unforgettable way to say goodbye to Leipzig! Happy New Year to everyone from the Glee Club!! This morning we set off towards Prague. The bus ride was sleepy--naturally--except that as we got deeper into the countryside, we were all awaken by neighbors' gasps at the beautiful landscape of the Czech Republic. There was a fine layer of frost hanging from the trees and over the fields. It was mesmerizing. Upon our arrival in Prague we were able to go towards the town center and roam the marketplace and get dinner. Can't wait to explore some more, and then sing in this beautiful city tomorrow! 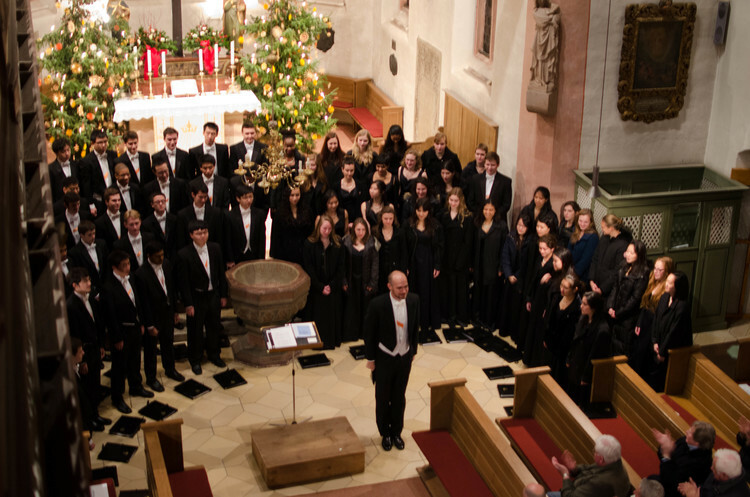 We opened our Europe tour with a fantastic New Years Eve concert in Roßtal, a small town just outside of Nuremberg. The church was filled to the rafters with enthusiastic townspeople of all ages – there were over 550 people there! The audience reaction was wonderful – we were honored to get two standing ovations! 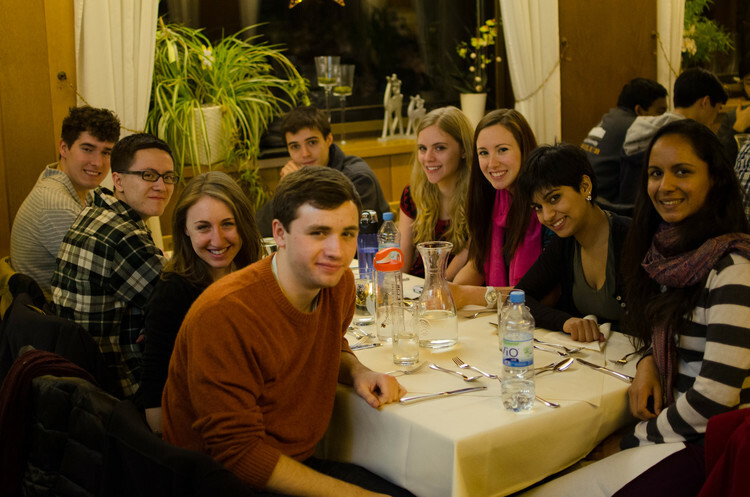 After the concert, we all rung in the new year together in a wonderful little Italian restaurant in Nuremberg. Counting down just outside the restaurant – it was fantastic! And to thank the restaurant staff, we sang for them, and they loved it so much that they chanted for an encore! Later, we enjoyed a wonderful night out and about in Nuremberg to celebrate the New Year – wishing a happy new year to all of our friends and family back in the US! Man, it has been a long day of travel. 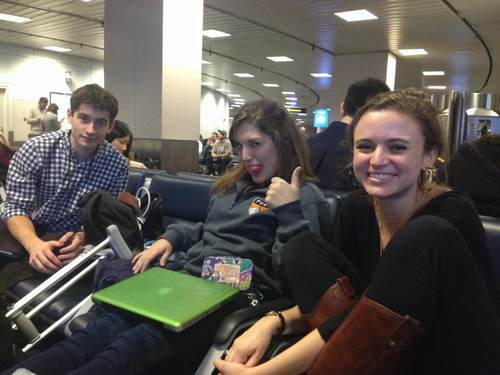 Jeffmin '15, Tova '15 and I ('15) arrived at Princeton at around 10PM EST on Saturday, the 28th. Then the next day, after a quick run to the Panera on Nassau, we walked through the pounding rain to the Old Dinky station, where we hopped on a bus to Princeton Junction. After a train ride, security and a bit of waiting, we were finally on our Lufthansa flight to Frankfurt. The flight itself was uneventful. There was a screaming baby that didn't seem to bother anyone else, but I didn't get a wink of sleep. I was able to finish World War Z by Max Brooks and watch part of "The Hobbit" and "Despicable Me 2" through other people's screens. When we finally landed, we walked through the long hallways of the Frankfurt Airport before finally clearing customs. We then waited around, somewhat deliriously tired but ready to take on tour. Jeffmin, Daniel '15 and I talked about our plans for the podcast and a few of us broke into an impromptu back massage line (we jokingly called it a Friday in Glee Club rehearsal, because we normally do back massage lines to start rehearsal on Fridays). When the tour bus finally arrived, we loaded up and headed out for Nuremberg. And that's about all I can remember - I fell asleep a couple minutes after we left the airport and only woke up when we got out for lunch. We stopped at the nicest rest stop that a lot of us have ever been to. There was a Burger King, a buffet and a convenience store on the first floor and an art gallery and fancy bathrooms on the second floor. After a quick meal, we were back on the road for another hour and a half. I'm about to head out exploring for an hour with my friends before coming back for rehearsal. There's still so much to do today! It’s 6.30am and I’m finishing up my packing for Glee Club’s tour to Germany and Czech Republic. I am really excited. The first tour I ever went on was with the Harare Youth Orchestra to a music festival in Bulawayo, a city in the southwest of Zimbabwe. I was 15 and it was the first time I had traveled for an extended period of time with a bunch of musicians all sharing the sole purpose of making music. We didn’t cross any oceans or board any planes, but we did spent 9 hours on a bus together and 4 days in Bulawayo. I remember early morning rehearsals that were a pleasure to attend, delicious food, great company, slight homesickness (but only slight), fantastic concerts, dancing until the wee hours of the morning and of course, strong friendships. After that first tour, I knew that I would always surround myself with a family of musicians. Now, as a senior in college, attending my first and last tour with the Glee Club, I am REALLY excited. I want to enjoy every single moment, lavish in the beautiful music we will make together and cherish the faces that make Glee Club what it is. Here’s to a wonderful tour!